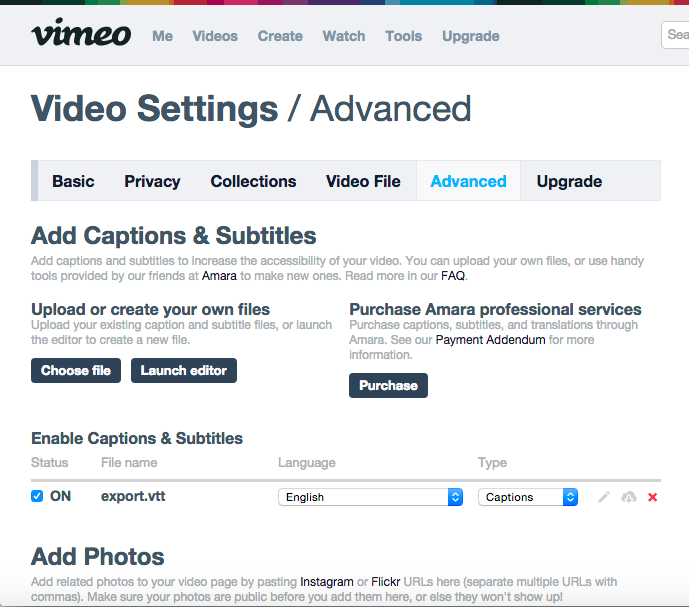 Whether you choose Vimeo or YouTube, uploading subtitles is a cinch. If you're more interested in YouTube, head over to our article "How do I upload subtitles to YouTube?" Note that this article details how to upload captions that you can toggle on and off with the Vimeo player. To permanently write your subtitles into the video image, head over to this support article. First, open up your InqScribe document and make sure your transcript and timecodes are in order. Once everything looks good, we're going to export as a WebVTT file. This will require InqScribe version 2.2.3 or newer. Vimeo also supports the SRT and SCC format, but recommends using WebVTT when possible. Select "File > Export > WebVTT...", name your file and choose a save location. Make a note of this location because we'll need to access it again in a moment. Before jumping into the directions below, first make sure to upload your video to Vimeo. You'll need to log in or create an account, then select the "Upload" button at the top right of Vimeo's site. It should be fairly self-explanatory, but if you need help, Vimeo has some tips here. Log in to Vimeo and navigate to the "My Videos" section of the topbar menu. Select your video and click on "Settings." In the Video Settings menu, click "Advanced". You should see the screen pictured below. Under "Add Captions & Subtitles", select "Choose file". Locate your subtitle/caption file and click Open. Your file should appear below in the Enable Captions & Subtitles section. Make sure to check "Status: ON" and select the language and file type. Select "Save Changes" at the bottom of the page and your video will equip with captions. To watch your video with the new captions, just click the "CC" icon in the Vimeo player. If you have any issues exporting subtitles from InqScribe, let us know by sending an email to support@inqscribe.com.